BOWLING GREEN – On September 12th, 2012, Federal District Judge Katherine B. Forrest issued a permanent injunction against enforcement of Section 1021 of the 2012 National Defense Authorization Act. In July 2013, the 2nd Circuit ruled the plaintiffs did not have standing to challenge that law. The lawsuit at issue, Hedges v. Obama, was brought in early 2012 by a group of journalists, scholars and activists. Containing such noted figures as Noam Chomsky, Daniel Ellsberg, journalist Chris Hedges, and others, this “Freedom 7” challenged Section 1021 of the 2012 NDAA as unconstitutionally overbroad. This section determines who is covered by the 2012 NDAA, and contains such vague terms as “substantial support” “direct support,” and “belligerent act” and, if one falls under one of these terms, they could be subject to indefinite military detention without charge or trial. “In 1944 the Supreme Court approved the pre-emptive detention of over 110,000 Japanese-Americans. The Court’s denial 70 years later proves that we cannot rely on 9 people in black robes to defend our freedom. If the outcome of this lawsuit does not cement the fact that the courts will not defend the Constitution, nor our rights with it, there is little more evidence to be presented. The Federal tier has failed us. The states, localities, and eventually the people, are where we will stand. As we resist, the work of the plaintiffs will not be forgotten. Standing has been a long help requirement of our judicial system…its nothing new. Now just get arrested under the act…. and if we can prove they have you…then you have standing! That is if its not kept secret. What about the people who have already been taken to the camps??? See you in the camps brothers. Dont you bet on that. Look for me Scamp. I’ll be the old timer with the stash of powdered alcohol. We’ll party. The only thing I will probably see is a body bag. But then again so with the ones I take with me. AMEN to that. When all else fails, use the Second Amendment solution. Just emailed my city council rep. copied a link from here. lets see what he says. Will follow up with a visit to his house, which is just around the block. Everyone needs to be aware of this folks. Share, share, share. Thank you for doing what most won’t: take action, instead of just complain about it. Sounds like sour grapes. SCOTUS hears circuit splits. Aside from the 2nd circuit, where else has this been challenged? Say good by to the Bill of Rights and the Constitution. Something I think all of you are missing. Since 1933 we have been at war. This suspends the constitution, and gives dictatorial powers to the president. If you want to stop the government from stepping on the toes of anyone, American or otherwise, that is the point to contest. However, we the people still have the ultimate power. That is who we choose to do business with and how. I help a local farmer for vegetables, a rancher for meat. I raise my own food as well. I generate my own electricity. I educate my own child with the help of some tutors who I trade with in silver. I market my own products in trade for silver or gold; or for some other good or service. I do not need currency, or government benefits. I have no ‘job’ for them to tax. I have no debt, and I am flourishing. I do not need them, I do not want them, and I have chosen to stop doing business with them. This is not the worst part….wait until they begin to use armed #Drones against U.S.Citizens on U.S. Soil then you’ll see an all out war… in any case this is very bad. OK, people time to think for yourselves. 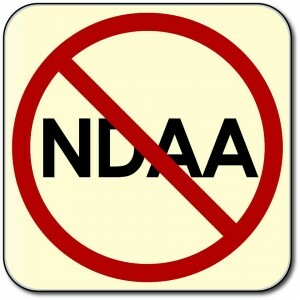 Read the 2012 and the 2014 NDAA at the links above. I bet you can not find anything that takes away your rights as a Citizen of the United States of America. Nothing can take away your rights. However, Section 1021 removes the protections of the Bill of Rights by making America a battlefield. Check out the 2012 NDAA, Section 1021 (c), for the punishments, and Section 1021 (b) 2 for who is covered. Per the 2014 Act that was HR 1960 , section 1021 is Naval Vessels and Shipyard. Clarification of sole ownership resulting from ship donations at no cost to the navy The 2014 Act supersedes the 2012 act, as it corrected items. Or in this case possibly removed them. So I can try to find this in the 2012 act, but then will have to see if it was moved or removed in 2014. So you see my Dilemma? 1021(e) Authorities- Nothing in this section shall be construed to affect existing law or authorities relating to the detention of United States citizens, lawful resident aliens of the United States, or any other persons who are captured or arrested in the United States. Kind of covers the Bill of Rights. You would think the person that wrote this column could actually put references to the CURRENT NDAA Act to show what this was all about. Because I swear they must just make this crap up out of either thin air or paranoia. It’s a really simple thing to link to the text your referring too and link the arguments. Thank you for commenting. I wrote this column, and as noted in the above release, the current NDAA is not at issue, The 2012 National Defense Authorization Act is the big deal here, and its sections are above. The two dangerous section are 1021 and 1022. Occupy the Supreme Court anyone…? Honestly, they should be overthrown and replaced with judges voted in by THE PEOPLE, and given term limits. As should Congress, for that matter.